Hey, who splashed tar all over the leaves of my lovely maple tree? At least that's what looks like happened when maples have the aptly named fungus disease "tar spot". It is manifested by shiny black, raised areas on the upper leaf surface that look like tar has been splattered from above. It is caused by several species of fungi in the genus Rhytisma. 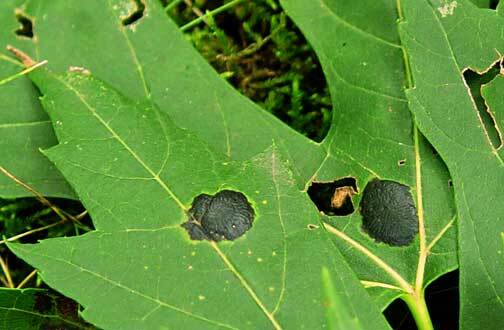 On native maples such as silver, sugar, red maple and box elder, large spots are produced by R. americanum, while R. punctatum produces numerous small spots, sometimes called "speckled tar spot". R. acerinum is found on Norway maple. In all cases, these spots occur in summer, but spores are not produced until the following spring. The spores are forcibly discharged from the location where they are produced in the black spot (called a stroma because it is actually composed of fungal filaments that are tightly interwoven to form a raised, flat fruiting body), and are carried away by wind. If wind currents bring spores to developing maple leaves they can germinate under moist conditions and get into the young leaf by growing through the natural leaf openings where gas exchange takes place. Yellowish-green spots develop where the fungus colonizes the leaf, followed by production of the black stroma on the upper leaf surface. The stroma forms ridges that give it a wrinkled appearance. Meanwhile the lower leaf surface, opposite the stroma, turns brown. Under long periods of moist conditions in spring, many leaves can be infected, and early leaf drop may occur. Fortunately, this disease does not cause much of a problem for its host, and it cannot infect trees other than maples. Since spores are not produced until spring, the disease is easily managed by raking up all the spotted leaves and destroying them in the fall. Fungicides labeled for this disease can be used when sporulation occurs in the spring, but are usually not recommended because the disease is not usually a problem. Interestingly, the disease that produces the large stromas cannot develop new infections where the air pollutant sulfur dioxide is present. In addition to tar spot, silver maple is susceptible to a number of other leaf spot diseases. One called "leaf blister of maple" is caused by a couple of different fungi (Septoria and Taphrina). The one caused by Taphrina was submitted the clinic last week, and as in tar spot, looks just like its name. The "blisters" are caused by a growth hormone secreted by the fungus inside the leaf tissue, which stimulates production of leaf cells in the infected tissue. Only young leaves can become infected, and infection usually takes place during cool, wet weather in the spring. The infected areas are confined between leaf veins, and do not cross over. The blisters become dark brown, giving the leaf a scorched appearance on the upper surface, and a whitish bloom surrounds the necrotic tissue on the lower surface. This bloom is where the spore producing structures have erupted through the leaf cuticle from the epidermal cells where they have formed, and released their spores. The spores are produced in summer, and are dispersed by wind. Some may lodge in crevices between leaf bud scales, where they overwinter and germinate in spring on expanding leaves to cause new infections. The symptoms on the leaves can cause concern, but the disease is not serious unless it is severe for several years in succession. Fungicides labeled for this disease can be used just prior to bud break, but are not usually necessary. Tar spot on leaves of silver maple (photo by R. Healy). Links to this article are strongly encouraged, and this article may be republished without further permission if published as written and if credit is given to the author, Horticulture and Home Pest News, and Iowa State University Extension and Outreach. If this article is to be used in any other manner, permission from the author is required. This article was originally published on August 8, 2007. The information contained within may not be the most current and accurate depending on when it is accessed.